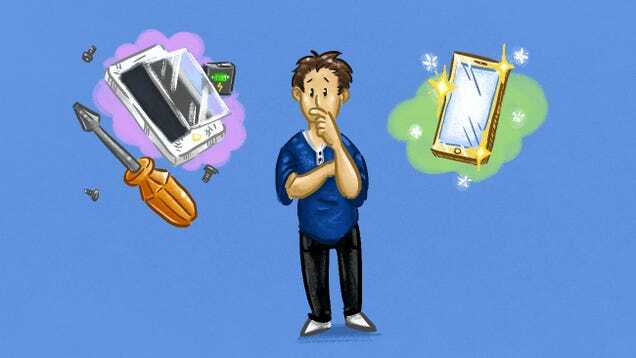 Should You Fix That Broken Gadget or Just Buy a New One? It might seem like new tech is always preferable to repairing older gear, but that’s only true if every upgrade is a good one. When we talked about how to make this decision when it comes to cars, we noted there’s a lot more to the picture there, and there’s more here too. Let’s tease out some of the things you should think about—depending on your situation, spending some cash to get new might be better than repairing what you have, and in other cases you might be better off fixing what you have. One thing to keep in mind when you’re comparing the cost of repairing broken tech to the cost of buying new is how much you’d make if you sold the broken item. Remember, people pay good money for broken tech on eBay and other places, so you can easily offset the cost of an upgrade by selling the broken item. That means if it would cost you $500 to repair your broken laptop, and a few hundred more could buy you a new, similar laptop, think about how you could soften the blow once you sold the broken one for parts, or how much more you could get for your money after you sell it. That’s just an example, and there’s no guarantee that your broken tech will sell for enough to make a difference, but do some research. Keep in mind some people might want your broken model for its working screen, battery, or other parts they can use to repair their own. The money you might make on your broken one may soften the cost of the whole affair. Just make sure to properly erase your phone or computer before you sell it. Before you decide to repair or replace, make sure you’re not giving up rights to future repairs or customer service when you make your decision. In some cases, getting a replacement from a company instead of repairing your old device means that you’ll get a refurbished version, or even a used one. Of course, “refurbished” isn’t necessarily a bad thing. In many cases refurbs are a better deal than new, and come with full warranties and other protections that you won’t get by repairing your old tech. Just make sure you’re buying from a trustworthy company. However, refurbs offered in the place of repairs may not come with the same warranty or purchase protection that your original item did. Make sure to ask. If you’re buying new, you get the same warranty and purchase protection that any new item offers (plus whatever your credit card may offer you.) On the other hand, if you pay to get your phone or laptop repaired, there may be a short warranty period for the repair work, but if you have future problems you might be out of luck if you don’t pony up for an extended warranty. As we’ve said, extended warranties are rarely worth it. When you’re making the decision to repair or replace, remember to factor in potential future repairs into your mental math. Consider repair time and how long you’ll be without your devices. If you choose to repair your current devices, make sure to find out how long you’ll be without your tech. After all, if your primary laptop is the one that needs repair, you’ll be without a computer for a while unless you have a backup. If it’s your phone, it could be even worse. You don’t want to be stuck in a never-ending repair hell where your laptop is in the bowels of some repair shop for months upon months while you wait. If a little more money could get you up and working in hours instead of weeks, it might be worth it. Consider set-up time, and how long it’ll take you to get back to normal. If your repair is something that can be done quickly, or even while you wait, it might not make sense to upgrade. You’ll probably spend hours trying to get your laptop or phone up and running with all of your settings. Even then, it’ll take you even longer to get back to that “productive” normal, where you don’t try to do something and realize you don’t have the files or apps required. While it’s fun for some people to break in new tech, others prefer to just turn it on and go to work. Make sure you know which one you are before you choose. Many years ago, I had so many issues with an old computer that it spent more time in a repair shop than it spent under my desk. For all the money I spent on it, I probably could have just demanded a replacement, but I had put so much time and energy into setting it up just the way I wanted that I kept thinking that a few more days in the shop wouldn’t be a big deal. After a few months of that, I realized the error of my ways. Your time is important—sometimes it’s worth considering which route will just save you the most time and let you get back to work (or play) as soon as possible. Finally, keep in mind that the value of your tech to you counts for something. This varies for everyone of course. Some people don’t get attached to their gear at all and treat it like cogs in a machine. Others will cling to an old laptop or smartphone for years upon years because it’s familiar, it works, and it does what they need it to do. Whichever camp you fall into has a huge impact on whether you should repair or replace. If you absolutely love your sticker-covered laptop and would rather get it fixed and use it for a few more years, that’s important and worth keeping in mind, even if your logical self (or friends) tell you otherwise. At the same time, you should also keep that sentiment in check so it doesn’t overwhelm everything else. It should be a factor in your decision making, but not the only one. Sentimental value can often make us keep things we should really get rid of, or repair items that would be much better replaced with something new. So remember, if it’s a tough decision and everything else is equal, maybe sentimental value tips you over to repairing rather than replacing, but if the chasm is wide, stickers can be moved and old tech repurposed. Plus, you’ll probably grow just as attached to your replacement as you are to what you have now. Of course, the actual decision is up to you—there’s no one answer that applies to everyone here. Sometimes it makes more sense to get your old, reliable, and trusty gear repaired so you can enjoy it longer than it does to spend the same amount of money on a new device that could be refurbished or problematic on its own. Other times, if you can score an upgrade or get the same item without the wear and tear you’ve put on the one you own, it’s a better route. Weigh your options—including the value of your time and how much the item means to you—and make a carefully considered decision from there. Title photo by Tina Mailhot-Roberge.